Flattering and moisturizing shaving cream with the luxurious sparkling scent Royal Forest. Due to the nourishing properties of the ingredients, the texture is especially recommended for dry to normal skin and makes for an optimal hydration. The shaving cream creates a rich foam and allows for a thorough shave. The nourishing Royal Forest Shaving Cream makes shaving to a highlight. Practically arranged in its pot, the shaving cream guarantees easy handling and makes for a great and voluminous foam with the help of a shaving brush. 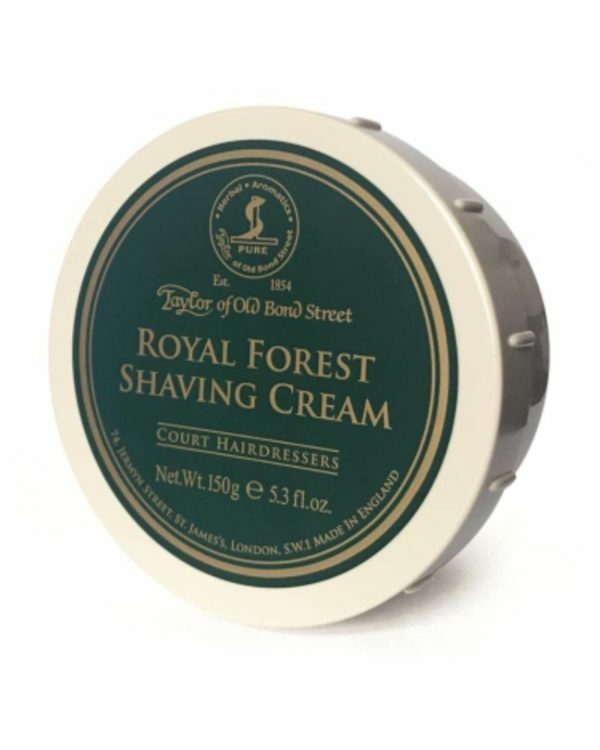 Due to the nourishing properties the premium shaving creams of Taylor are recommended especially to dry to sensitive skins. The high amount of glycerin softens the beard hair and protects the skin from drying out. The shaving blades glide easily and promises thereby for a clean shave. 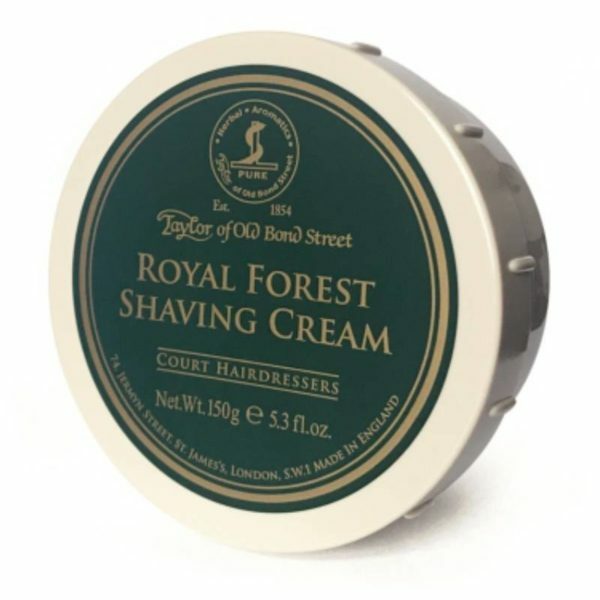 Economical at use, the Royal Forest shaving cream of Taylor of Old Bond Street is long-lasting and effectively nourishing. The shaving cream in the scent composition Royal Forest adds a fresh-floral scent to the skin after shaving, making for a smooth and pleasant feeling on the shaved areas. All products of Taylor Old Bond Street reflect the philosophy of the British company: high appreciation of traditional knowledge of selected essences, ingredients and aromas, which Taylor of Old Bond Street has united in exquisite scent variations and in best shave- and body care products over generation. The fresh, manly scent Royal Forest of Taylor of Old Bond Street is a facetious combination of fruits, flowers and earthy notes. With bergamot, apple, various berries and pineapple, the scent opens with extraordinary fruity power. In the middle, soft floral hints of jasmine, rose and patchouli unfold – masterly emphasized by some black pepper. The base is calm and relies strongly on oakmoss, ambergris and musk – emphasized by a hint of sweet vanilla. Royal Forest is a fully revitalizing and motivating scent. Foam a hazelnut-sized amount with the help of a shaving brush in your hand or in a pot. Apply the rich foam on the to-be shaved areas. Enjoy the smooth and thorough shave.